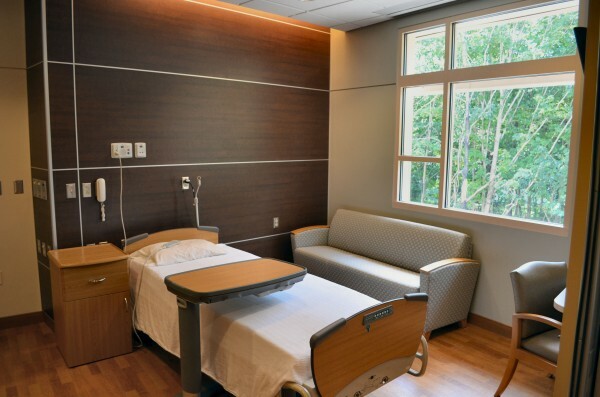 One half of a super suite in the new inpatient wing of Sebasticook Valley Hospital in Pittsfield on Tuesday, July 16, 2013. Two workers help with the finishing touches on an expanded wing of Sebasticook Valley Hospital in Pittsfield on Tuesday, July 16, 2013. The new wing is expected to open on July 22. 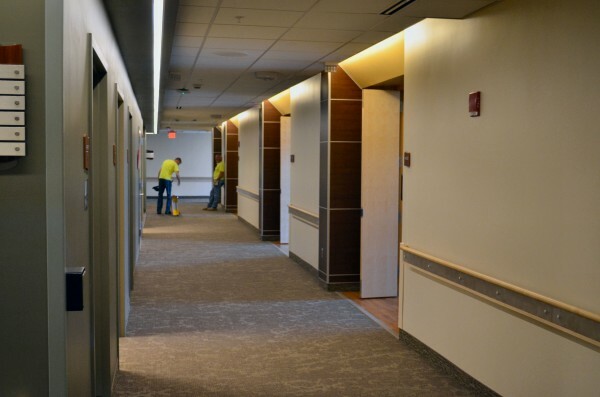 PITTSFIELD, Maine — Construction crews were putting the finishing touches on a new inpatient wing of Sebasticook Valley Hospital on Tuesday in anticipation of patients being moved in next week. The 33,000-square-foot, two-floor expansion was unveiled to the public on Saturday when nearly 150 people toured the new wing, which features 19 beds on the second floor with 17,000 square feet of renovated space. The first floor is a loading area and a large room with an undetermined future use. Once construction is complete in the new wing, patients in the six-bed portion of the older section will be moved to the new beds. The older section will then be renovated to match the new wing. Construction is expected to wrap up in November. The new wing is the first phase of a $14 million expansion project for the hospital, which was built in 1963. The hospital celebrated its 50th anniversary this year. Ground was broken on the new inpatient wing in June 2012. The project utilizes 22 contractors, with 19 based in Maine. Lavallee-Brensinger Architects of Manchester, N.H., designed the project. The new wing features five super suites, each of which has two beds with separate bathrooms. There will also be 15 private rooms when the project is complete in November. The super suites are 540 square feet compared to the rooms they’re replacing, where two people share 217 square feet of space and only one bathroom between them. The private rooms will be 360 square feet. The larger space will better accommodate new, bigger equipment and visiting family members. Having one bathroom per patient was important, Yarbrough said. “It’s privacy for the patients as well as helping with infection control,” she said. The hospital is not adding to the number of beds it has, but instead is making them bigger and modern. Keeping the same number of beds is a requirement for a Critical Access Hospital, which can have no more than 25 inpatient beds and must provide 24-hour emergency care and be more than 35 miles from the nearest hospital. That designation gets a bigger reimbursement from Medicare. “It’s an incentive they have so hospitals don’t close,” she said. The new impatient wing is the first of a four-phase project that began being planned in 2009, she said. Details of other phases are only concepts at the moment. The project is funded through savings, loans and donations. She said the fundraising is nearly halfway to the hospital’s $2 million goal.